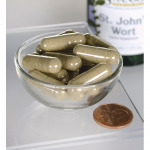 Swanson St. John’s Wort is a leading dietary supplement for maintaining mental and emotional health. When your body is experiencing stress and you feel nervous and restless, the leaves and flowers of this wonderful shrub will help you relax and regain your good mood. Because of its unique ability to have positive effect on our feelings and emotions, St. John’s Wort has quickly become one of the most popular herbal supplements in the world. Other ingredients: Gelatin, magnesium stearate, microcrystalline cellulose (plant fiber). Suggested Use: As a dietary supplement, take one capsule per day with water between meals or as recommended by your healthcare provider. WARNING: Not recommended for pregnant or lactating women. If you are taking a prescription medication, including birth control pills, consult a healthcare professional before taking this product. This product may cause the skin and eyes to become photosensitive. Avoid lengthy exposure to natural sunlight or tanning salon lights. Discontinue use if reddening or inflammation of the skin develops.